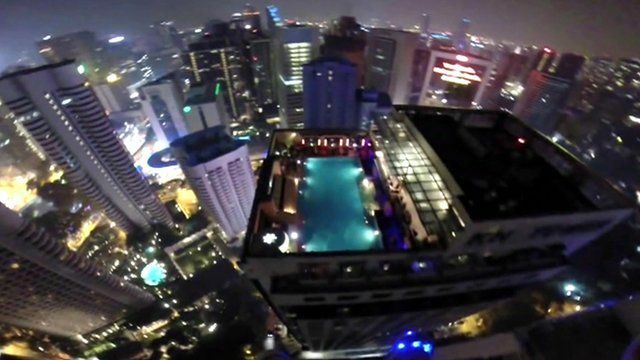 Base jumpers 'gatecrash' pool party Jump to media player A group of American base jumpers in Kuala Lumpur have launched themselves off one skyscraper to land at pool party on the top of another. Record base jump from tallest building Jump to media player Sky divers Vince Reffet and Fred Fugen have set a new world record by base jumping from a platform on top of the world's tallest building, the Burj Khalifa. 'People come here to live, not die' Jump to media player The BBC's Imogen Foulkes reports on the sport of base jumping and why it is attracting and ever increasing numbers of people who enjoy jumping off mountains with a parachute. Why people jump off cliffs for fun Jump to media player Base jumper Justine Edde takes us with her as she jumps off a 700m high cliff in the Swiss Alps. Base jumpers leap from 370m bridge Jump to media player Base jumpers from around the world have been competing in Anshun city in China's Guizhou province. Jumpers in court for Freedom Tower leap Jump to media player Recently released video shows three base jumpers leaping from the top of New York's Freedom Tower skyscraper in the middle of the night. A group of American base jumpers in Kuala Lumpur have launched themselves off one skyscraper to land at a pool party on the top of another. One at a time, the extreme sports enthusiasts jumped off the 330m-high Kuala Lumpur tower and parachuted towards a nearby skyscraper rooftop. The daredevils landed in the pool where they were met by cheers from fellow extreme sports enthusiasts. John Van Horne, who filmed the stunt, spoke to the BBC's Rico Hizon.